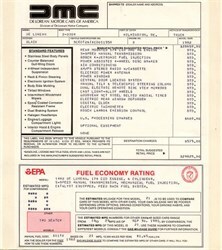 DMC 12 Original Window Sticker from the Delorean Motor Cars of America issued in 1982. This item still has the peel back label. The car's total cost was $29,825 with an estimated 21 miles per gallon of gas.